Occasions: Anniversary day, birthday, wedding, party, date, New Year's Day, Valentine's Day, Thanksgiving Day, Christmas Day or some special occasions. 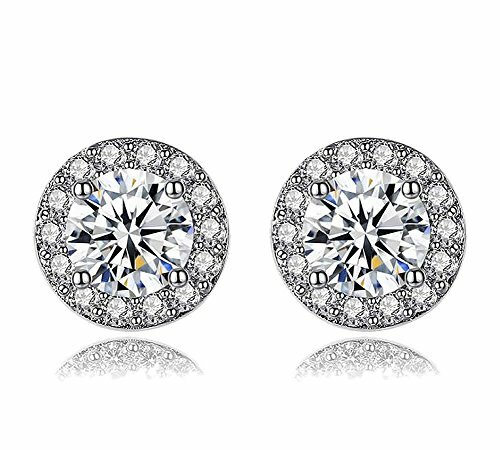 ❤Inspiration: Featuring 925 silver plated with white zircon, punctuated with stunning round-cut cubic zirconia centerpiece framed in cushion shape halo of dazzling smaller stones beauty marks. ❤Package: This item comes with a gift box and pouch. Perfect item for your girlfriend, fiancee, wife, lover, mom, daughter, aunt and friends. It is also a good choice for anniversary day, birthday, wedding, party, date, New Year's Day, Valentine's Day, Thanksgiving Day, Christmas Day, Boxing Day or other special occasions. ❤Service: Wonvin strives to provide the best jewelry and service for all our customers. And we provide 30 days money back or exchange guarantee to protect you when you receive any defected order. If you have any questions, please feel free to contact us. If you have any questions about this product by colorstation, contact us by completing and submitting the form below. If you are looking for a specif part number, please include it with your message.